We are thrilled to announce the release of Adium 1.4, the culmination of an epic two years of development effort. This release features Twitter and a significantly better experience in group chats – including support for IRC. It’s jam-packed with hundreds of other new features and bug fixes, too. Adium 1.4 now requires Mac OS X 10.5.8 or higher. The contact list now supports contacts in multiple groups and instant searching in any configuration. This update also brings a better authorization window, updated and revamped message styles, new customization options, an updated version of libpurple, faster launch time, less memory usage, and better performance are just the tip of the King Eider iceberg. The full, staggering list of enhancements and bug fixes may be found in the full list of changes. 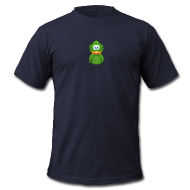 To celebrate the release of Adium 1.4, we’re also introducing official Adium apparel. 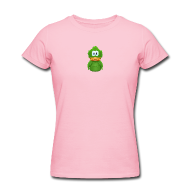 You can pick any color Adiumy and sport it on any color t-shirt, plus some sharp long sleeve t’s and a hoodie. We’ve prepared a few stylish combinations in the merchandise store for you. Shirts come in men’s, women’s, and dog’s styles. The revenue from your purchase directly supports Adium. Questions or comments? Got a cool idea for a new shirt configuration you want to see? Let us know! Adium is an open source, volunteer, community effort. Want to see faster releases? See how you can help out by contributing code, assistance, or resources on our development page. You can also choose to donate, since we’ve joined Instant Messaging Freedom, Inc., a 501(c)(3) non-profit, it’s even tax-deductible. We’re thankful to Network Redux for their immense server resources, and CacheFly for their staggering bandwidth. Without them, none of this would be possible. hahaa! i’m gonna buy a shirt! Great job guys! Just wanted to say thanks for all of your hard work on this application. It means a lot to many people. You guys are the best. Happy Halloween! As an aside, does this build include the changeover from old-style Facebook chat to XMPP, or is it still wise to use the Jabber account type? Hope to see 1.5 beta as soon as possible. Any chance of an Adiumy baseball cap? works great for me except for the detect when someone is writing to me icon doesn’t show up most of the time. Sometimes it does but not very often. Adium 1.4 quits unexprctedly on Mac OS X 10.5.8 PPC. 1) It shows ugly “lost focus here…” text in chat window. What is it??? 2) It renders Tahoma 12 font ugly in case of antialising disabled. Too bad the update messed up everything. My contact images were gone. Won’t connect to facebook. Pretty much everything is broken. Good job. Very nice. Very glad to see IRC. I hope you guys are watching the progress of Google’s Wave ideas. I think that’s going to rule eventually. An interface to it that also supports what Adium supports will be an obvious need in a year or so (I hope). what you have done with [Smooth Operator] message style?! is there any way to force [Smooth Operator | Classic] to look as it was in 1.3? Nice update. Glad IRC is finally on Adium. The update messed up my whole contact list… some merge contacts appear 3 times now, merging them again causes adium to crash, deleting merged contacts doesn’t work. I’ve noticed that sometimes messages from friends who has older versions of Adium, sometimes their message doesn’t get through. This started today when I downloaded and installed the new version. I’ve gotten asked why I didn’t respond to the message quite a few times today. Happened on two different computers on two different places. Anyone else unable to connect to Yahoo? Ugh, I don’t care what groups my Facebook friends are in, I care about which accounts Adium is signed into. I want to see “Offline”, “Facebook”, “MSN” etc, not “Offline”, “College”, “Friends”, “Other”… Is there an easy way to edit groups that does not involve going through each and every contact and assigning a group? where the hell do i put in my PIN? @Matt Select, drag, and drop. Quick & easy. @Everybody else. Thanks for your comments. This is not a support forum nor a bug tracker. Please go to the appropriate places for anything that isn’t a comment on the blog post! Thanks very much to you all guys. It running perfect for QQ and MSN, now I just run it instead of all my IM . Looking forward a new version that available for video&audio chat. looks like 1.4 stopped working with MSN. Is there some place I can go to “downgrade” back to 1.3.x? It sounds like there are some stability issues. My issue is that it is no longer showing when people type to me. Or at least, it’s not showing it consistently. It sometimes shows it, but sometimes doesn’t, and there doesn’t seem to be any pattern to it. It’s really frustrating. I might switch back to iChat if this doesn’t get fixed SOON! There’s a major stability issue with the 1.4 release! My GTalk account keeps disconnecting every 3-5 minutes. Some minor MSN connectivity issues also appear here and there. Facebook and Skype contacts now appear in mysterious new groups, putting them back in their old groups doesn’t work, they’re going back to the new group own their own. The changes to the minimal_mod message style showing the vertical lines is driving me nuts. When trying the beta’s I thought it was a bug, now I see its a “feature”. Would really like to see this removed, if I have to resort to cloning it and making my own I might. I really like the simplicity of the theme, just think these new lines totally blow that aesthetic. I ask, where is the ability to disable user icons in the contacts list? In version 1.3.9 I had a nice sun of gadu-gadu on the right side of each contact, now in version 1.4 I have these stupid user icons (avatars)! Please make a option to disable the icons that users in contact list. Adium is indeed awesome. Been using it since at least version 0.89! In answer to your question, Adium does not support video chatting, so there is unfortunately no way to invite your friends to see your cam and vice versa. Video chat has been an often requested feature throughout the years, but the developers have said a few times that it hasn’t been one of their priorities due to the time and manpower required to get it running. This is, after all, an open-source volunteer-based project. T-shirts, hoodies and doggie shirts look awesome! Please offer a v-neck ladies tee! I’ve ordered 2 t-shirts, and have just received them in France, after only 10 days (instead of the 2-6 weeks announced). That’s fast, and I love those t-shirts. Thank you !